AGV (Automated Guided Vehicles) systems in some ways follow the evolution of America's transportation system. Railroads represented the first "automated" transportation for material; people and products. These systems were constrained to run on pre-defined routes with specific schedules. Changing routes, or adding destinations, was a monumental undertaking. The system evolved with the introduction of the interurban rail system (e.g., trolley systems). Routes and destinations were fixed yet easier to change, but scheduling remained inflexible from an individual's perspective. Automobiles were the ultimate solution. Individuals could now control the destination, route, and schedule to meet their demands. This flexibility came with the hidden expense of traffic congestion and lost throughput. Mobile robots and AGVs have been used for many years to move material within industrial facilities. The early AGV implementations followed a floor mounted magnetic or radio-frequency track, and frequently performed simple point-to-point transports with a known schedule or takt time. What is dramatically changing the value proposition in the manufacturing and distribution sectors today is the recent advancements in Fleet Control System (FCS) software which provides companies the ability to manage, monitor, track, organize and ultimately, optimize, their fleet of cooperative mobile robots. The Fleet Controller connects to individual mobile robots using wireless communications, providing graphics-based displays of all mobile robots and their current status-mapped to the facility floor plan-in real-time. Today's Automated Autonomously-Guided Vehicles (AAGV) eliminate the need for floor-base track by constantly measure their environment using state-of-the-art sensor suite and locating themselves on a virtual map. Changing routes or adding destinations is now as simple as drawing lines or dots on a computer screen. The scheduling challenge to manage congestion has been overcome with the advent of a Fleet Control System. An FCS actively manages all transportation orders and job activities to optimize the schedule, vehicle selection, and routing. The combination of an AAGV and an FCS represent the ideal solution to support the today's dynamic industrial environments. Frequently, these solutions are built on readily available software platforms with standardized external interfaces which ease extensibility, both vertically and horizontally. The interfaces enable rapid integration with Warehouse Management Systems (WMS), Manufacturing Execution Systems (MES), or localized work cells built from differing compute platforms, such as programmable logic controllers (PLCs). The lowest cost solutions utilize a single workstation to coordinate and monitor all system aspects including order execution, vehicle status, and location, adjustable cycle time monitoring periods, reporting of faults, errors, and over cycles. Far more dynamic than merely a traffic controller, the Fleet Control System maintains real-time communications with each vehicle. It monitors all vehicle diagnostic information and is responsible for optimum work assignment and traffic routing. Many Fleet Control Systems can easily import CAD or other image files of facility layouts to assist users with spatial relationships presented in on-screen views. With "real-time" AGV status displayed using dynamic color changes, users can hover over an icon representing an individual vehicle to view AGV information and location, or drill into currently executing work details. Detailed system performance information is saved in data warehouses for data mining, allowing users to define metrics and create custom reports. Users can view and print these reports or track historical trends to evaluate the impact of process optimizations. 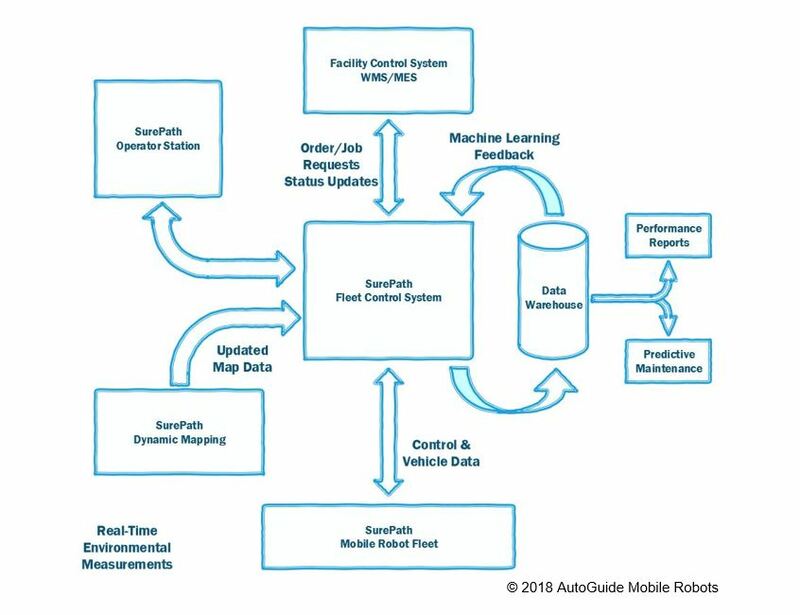 When data from the vehicle sensors and operations are collected, the machine provides deeper insights, so operations managers can optimize system performance. An open system architecture gives customers ultimate flexibility. Even home-grown system elements can be integrated with these systems, regardless of manufacturer or vendor. This versatility makes the fleet control software easy-to-integrate with existing infrastructure. As an example, mobile robot systems can be employed to replace existing manual transport between work cells, as is typical in a manufacturing environment. With the installation of simple remote call buttons, the fleet control system monitors the incoming request and optimizes vehicle selection and routing. While en route, the FCS can dynamically switch vehicle assignments, alter the path around local objects, or change the overall route to avoid traffic congestion and improve performance. Rob Sullivan, AutoGuide Mobile Robots' President and CEO is a proven robotics and automation leader with a solid track record of pioneering innovative products. With over thirty years of career advancement in high technology companies ranging from burgeoning start-ups to established multinational corporations, he offers a rare combination of business leadership and engineering expertise that resulted in ....... See More Details.